In a saute pan saute chopped onions and celery in a little olive oil until onions are starting to be translucent and celery begins to soften. Then in a large soup pan add cooked and drained hamburger, beef broth, sauteed onions and celery, both cans of diced tomatoes, 1 cup tomato sauce, frozen carrots, and a clove of garlic minced or pressed through garlic presser (you could add two cloves if you like a bit more garlic flavor), add salt and pepper to taste as well as a tablespoon of Italian Herb blend ( I use McCormick's Gourmet Italian Seasoning, if you don't have that you could add your own mix of basil, oregano, thyme, and rosemary). Add a couple cups of water to the soup as well and simmer on medium to low for a couple of hours, check often and stir, add more water if needed. After two hours, add in drained can of corn, more salt pepper and another teaspoon or two of Italian seasoning to taste. Continue cooking for another 45 minutes or so on a low simmer, cook until veggies are cooked through and softened, and broth has a nice flavor. You can cook longer if you want to on low until you are ready for dinner. Cook and drain your soup pasta, I always serve my soup pasta on the side and we add it to the bowl before ladling soup over pasta, that we we can all choose how much pasta we want, and the pasta doesn't get soggy. Serve with corn bread and a sprinkle of shredded Parmesan, the cornbread is delicious with this hearty soup, we like to put a slice right on top of the soup! This soup was perfect for our stormy spring weeknight! 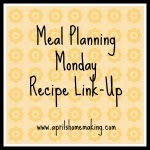 Stop by and link up your recipe post to Meal Planning Monday Recipe Link-Up. Your soup looks delicious! I love hamburger soup and always have since Toms mom introduced me to it! My mom always used a soup bone! Only difference I guess was the nest...smile! Looks like a yummy thrifty meal, April. Our spring has been the same here, only about 2 degrees cooler. But it doesn't seem to bother the plants, tulips and daffodils are glorious this year!